Cape Town - All serious motorcycle enthusiasts will at one point in their lives have watched the seminal 1971 documentary film On Any Sunday. In it we follow the lives of various motorcycle racers and racing enthusiasts. The bikes they ride in the film are heavy, slow and primitive by today’s standards, but they remain unquestionably cool. BMW recently launched the much anticipated R nineT, an off-road version of the popular R nineT. You may be forgiven for thinking that the R nineT is a whimsical bike that’ll disappear just as soon as skinny jeans, the man-bag and artisan beer lose popularity. This may or may not come to pass. The fact remains that two of the most recognisable motorcycle brands, BMW and Harley-Davidson, share a common strategy: both manufacturers sell a complete lifestyle package, rather than just a motorcycle. Alex Baraka, BMW Motorrad SA’s general manager emphasises that BMW focuses 80% on lifestyle and 20% on rationality. But he adds that the R nineT isn’t a passing fad to satisfy current trends, it’s the evolution of a long line of motorcycles, starting with the R32 way back in 1922. Viewing the R nineT on the showroom floor I began to see what Alex Baraka was saying. The bike’s styling clearly harkens back to the machines Steve McQueen, Malcolm Smith and Mert Lawwill rode in the closing beach scene of On Any Sunday. However, instead of fiddly carburettors and drum brakes this scrambler has all the modern equipment we have come to rely on: From traction control to a digital instrument cluster, although the latter is disguised as an old-timey analogue speedometer. Above the display bike hung posters of bearded men wielding huge spanners and skinny women sipping on craft beer. 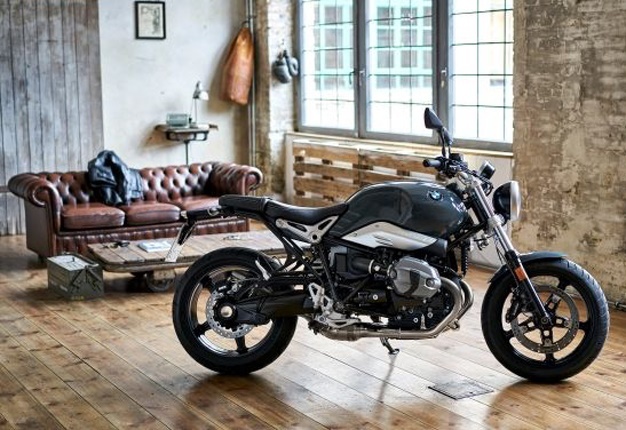 Goodness knows what those massive tools are meant to fix, but the models - who BMW assures us are real bikers - certainly look like they belong on R nineT. We rode in convoy through Cape Town’s city streets where the bike’s 19” wire spoke, front wheel felt heavy in slow, tight turns. It’s easy to get used to though, and doesn’t feel worlds apart from a GS. By the time we reached the sweeping curves of Chapman’s Peak Drive the bike had already become an extension of my body. There’s little chance of that happening though, the Metzeler Karoo 3 knobbly tyres will warn you soon enough. The Metzeler Karoo 3’s look great on the nineT, but unfortunately they are quite noisy. Once you exceed the legal speed limit the vibrations caused by the aggressive thread pattern becomes a bit unlikeable. Although I didn’t get the opportunity to test the R nineT on a gravel road (BMW requested that we stick to the tarred route they mapped out for us) I could tell that it’s no GS. The suspension is very firm and the 125mm front wheel travel is far less than the 190mm offered by a R1200GS. Hitting even a small pothole at speed does not go unnoticed. The R nineT Scrambler is slightly detuned from the R1200GS and yet strangely it feels every bit as powerful. It does carry nearly 20kg less weight, but I suspect it’s an illusion created by the throaty Akrapovic tail pipes and total lack of wind protection. Despite any criticism I may have inferred, I truly am impressed by the nineT. It’s a ton of fun to ride and it looks very smart parked in front of your favourite coffee shop. I can’t comment fairly on whether it’s good off-road but I have my reservations. I can’t see it eating up the miles on long road trips either. It’s simply not built for it. So what’s it for? It’s a cool as ice motorcycle that looks as if it just rolled off the set of an Indiana Jones movie. It’s wish fulfillment and status affirmation rolled into one. Will this bike find a market? The first shipment to South Africa was sold out long before arrival and dealers are clamouring for more stock. Will it be the next GS for BMW? Highly unlikely, but even BMW is surprised by the interest from buyers. Type: Air/oil-cooled four stroke flat twin engine, double overhead camshaft, central balancer shaft. Front: Telescopic forks; 43 mm stanchion diameter . Rear: Single-sided swing arm with paralever, adjustable pre-load and adjustable rebound.